Whether English or Western, leather play a big part in keeping you safe, in providing you comfort and ultimately, in the pleasure you get from riding. Being exposed to sun, wind, sand, dirt and other weather conditions, makes it necessary to clean, condition and moisturize your leather regularly. Here are a few tips to make this job quick and easy! To clean your saddle after each use is wise and time well invested and under normal conditions, it can be done in only a matter of seconds. Also, the sooner dust, dirt or mud is removed, the easier it is to do! AQUILA gentle leather cleaner cleans remarkably well and it can be used daily. It contains no wax (that can build up when used on such regular basis), no alcohol (to dry out leather), no glycerin (that stays sticky and builds up), no silicone (to make leather slippery and burn and ruin leather...), no chlorine (to dry leather and burn colors). You can clean everything with AQUILA: gloves, chaps, saddles, etc. To clean porous leather (such as calfskin), spray AQUILA onto a soft cloth and quickly wipe. Otherwise, you can spray AQUILA directly on the leather. 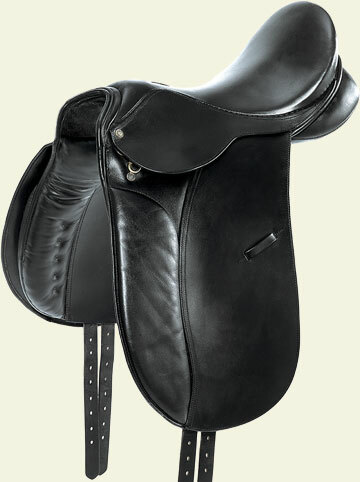 If the leather near the stirrups is muddy, remove excess mud with a cloth or a soft brush before cleaning with AQUILA. Moisturize and condition your saddle with URAD natural one-step-does-it-all leather cream. URAD will replenish your leather with natural lanolin oil, bringing back life and beauty to your leather. URAD's natural carnauba wax protects your saddle from sun UV rays and rain, and restores a natural shine. The key to using URAD is to use it like a skin cream e.i. use very little and spread it thin until it is absorbed into leather. To prevent any wax build ups, go over the stitching areas last, when there is barely any product left in the applicator. The underside of saddles and the bridles can be conditioned using GRASSO. GRASSO deeply and quickly soaks in, moisturizing, waterproofing and softening the full grain of the leather. It is also a quick and efficient way to help break-in a new saddle. GRASSO just like URAD should be applied and spread in thin coats. URAD already feeds oil to the leather during regular maintenance. However, maybe once a year (or if the leather seems to be dry, when breaking-in a new saddle or before storing away for a longer period), to deeply moisturize leather, you can use GRASSO on the saddle's seat side as well (wipe off any excess before riding). Using both AQUILA and URAD has proven to be an efficient method to prevent or, if already present, to get rid of mold and mildew. You can clean Suede, calf skin or other delicate leather with AQUILA. However URAD is usually not recommended on these porous leathers. URAD black (or URAD with color) is usually preferred over the neutral for the care of tall boots. Give your leather the Tender Loving Care it deserves! These steps require such little time and effort yet, they make a huge difference in the long run. Taking the time to clean, moisturize and protect your leather will preserve its qualities, its value, and it will keep it looking good for years to come!